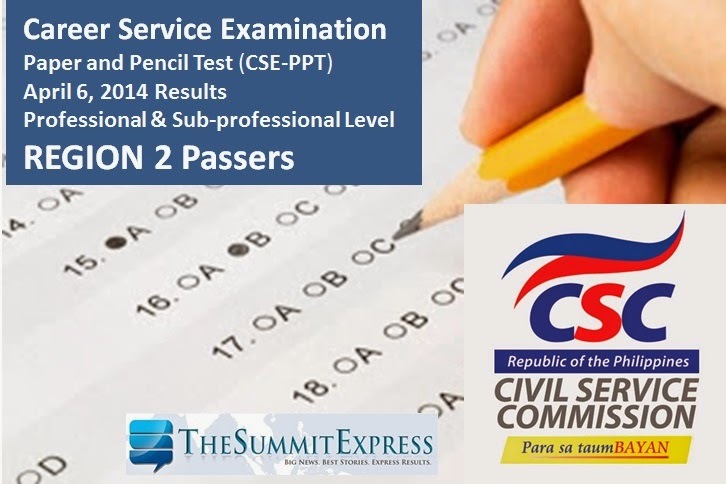 The Civil Service Commission(CSC) on Monday, May 19, 2014 officially released the list of passers for April 6, 2014 Civil Service Exam - Paper and Pencil Test (CSE-PPT) also known as Career service examination. The list of passers for Professional and Sub-professional levels for Region 2 (Cagayan Valley) are now available on this page. Examinees from these provinces may now check results on this page: Batanes, Cagayan, Isabela, Nueva Vizcaya, Quirino and Santiago.